2P START! Live! 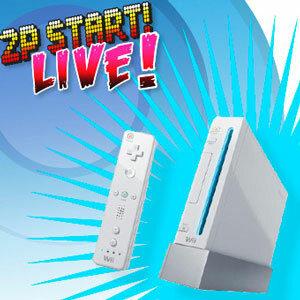 : Free Wii Edition | 2P START! In this episode, Tim and Ray give away a Wii! Black Doom, Comic Talk, and Suggestion Box are all here too as a consolation prize to the rest! caught it, can’t wait to listen to the podcast, not getting my hopes up about the wii, but maybe, juuuust maybe…. not even 32. plenty of people commented more than once, so its probably more in the range of 20 or so. either way, the odds are relatively nice. too bad we didn’t get number 1. oh well, plasma tv would’ve been nice. oo, i got my fingers crossed. yet my hopes aren’t too high up. nice zelda music in anticipation. and i didn’t win. oh well. wait, a t-shirt!!!! ‘crossing fingers’ darn. every dang time! oh well. I’d like to sing a song about Coraline…. 2. I’m not sure when you recorded the podcast, but I guess it was before you read that all those other commenters offering to give their Wii up if they won. 3. Although I didn’t have too much to comment on, there were quite a few laughs, especially when you trying to pronounce the name of the winner from the second drawing. 5. I can’t say I have any plans to see Coraline, it just doesn’t appeal to me. I can’t say I’m in love with this song, but I just have to suggest it once for Musical Misfits, just because of the above statement. Oh also, what happened to that segment that featured music from upcoming games? You only had that segment…once? Well there’s a Wii game that’s going to come out in Japan soon, and this is a song from it. It’s awesome, it may be just be my favorite video game song. Oh! What did I win? I’m starting it now! Sweet! A shirt! Now I must decide which one! And thanks for taking my suggestion for the Sonic hat! At least you didn’t try to pronounce my name then. Perhaps Tim should just take over the podast. At least he can pronounce geeky usernames! BTW, I hope you figure out something for comatose’s Wii! Huh? #30 comment was D3vin. Maybe I’m not understanding the way you’re drawing this :S Have fun! You’re looking in the wrong blog post. Good podcast can’t wait for a new comic. Alright. I emailed Ray to tell him I decided on the Support Our Troopas shirt, unless he was planning on adding any new shirts soon. Then I might change my mind! Is that why your gravatar is a penguin with a hat on, by any chance? If it is, great job blending everything you love into one! No Musical Misfit? That was my last chance to “win” something… ah well. Congrats to comatose and unbuntun3rd! No, I checked the thread, because I remember Tim had posted, and they had gone through and deleted duplicate/Tim’s posts. Wow. A short one. No Musical Misfit? How about I suggest one? The one I took back last week, maybe? Hideout Helm Countdown, from Donkey Kong 64. And only one Black Doom Award, as well. Not to mention that the closest we got to a T-T-T-Topic of the Week was the drawing. Too bad you guys gave us a short Podcast, but at least we got the drawing from Ray’s Sonic hat! Well, I didn’t win the wii, but I won a comment of the week. Thats like 10x better, right? Yay for my second CotW! i just wanna know if everyone knew what the theme song is. tim, ray, i do know what it is! And shame on Tim for not having a Black Doom Award! I blame Ray for this disappointment! Next, instead of baby/old Tim & Ray, you should do Tim & Ray…but they’re in SPACE! Yeah, I have to admit, I feel a bit like that myself…like I said, I had more to say about the “Don’t Listen Edition”. Don’t get me wrong, I enjoyed the podcast, but I always enjoy the 40 minute ones as opposed to the 20 min ones. Now obviously I don’t know what you guys did and didn’t have time for but Musical Misfits, Remix, or whatever would’ve been nice. or here it is in fun 8-bit! I’m betting that someone’s Black Doom award next week will be Mario and Sonic at the Winter Olympics. Also this is really random, but I feel I should say it because it’s kinda funny. Hmmm… It seems the 2P Start Podcast is affecting our lives in very strange ways… Ray, are you sneaking subliminal messages in the podcast or something?